Patty got to watch both the fireworks Eastern Bank had shot off over Boston Harbor to celebrate its 200th anniversary and the Lucinda Williams concert at the Blue Hills Bank Pavilion (anybody see them from the State Street building?). Read more. The FBI Bank Robbery Task Force has released photos of a guy it says held up an Eastern Bank branch at 63 Franklin St. around 8:20 a.m. on May 19. A federal jury yesterday convicted a Watertown man on insider-trader charges for buying up shares of Wainwright Bank before it was acquired by Eastern Bank - based on a tip a friend who worked at Eastern wrote him on a cocktail napkin. Robert Bray, 78, will be sentenced on May 4, the US Attorney's office in Boston reports. He faces a maximum sentence of 20 years in prison and a $5-million fine. Read more. 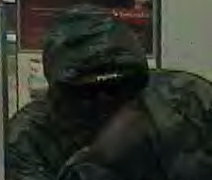 Boston Police have released two photos of a guy who did an excellent job using his hood to hide his face when he robbed the Eastern Bank branch at 246 Border St. on Saturday. He's described as black, 6'2" and clad in a gray hoodie. Police say he gave the teller a note and threatened violence if he didn't get money. The Eastern Bank branch on Centre Street at Lagrange is closing in December, apparent victim of a tiny parking lot off a busy intersection. No word if it will be replaced by another bank, a funeral home or a pizza place. The Eastern Bank branch at 687 Centre St., around 10:20 a.m. The FBI's Bank Robbery Task Force reports a man who held up the Eastern Bank Branch at 470 W. Broadway last Monday while wearing a shamrock cap is probably the same guy who held up the branch on Jan. 21 while wearing a Bruins cap - and the guy who held up the Santander Bank branch at 474 W. Broadway on Feb. 17. He's described as white, about 5'9" with a slender or medium build and clean shaven. The Eastern Bank branch at 301 Harvard St., around 3 p.m.
Photo from last week's robbery. The Eastern Bank branch at 155 Dartmouth St. was held up around 2:50 p.m. by a white man in a gray hoodie, a ball cap and sunglasses. Police suspect it's the same guy who robbed the branch last week because he has very big ears. As he did last week, the robber presented a note, then grabbed it back when he got money. He did not show a weapon. Photo released by Bank Robbery Task Force. The Eastern Bank branch at 155 Dartmouth St. was held up around 12:15 p.m. by a man who showed a note, but no gun. He's described as being in his mid 20s, 5'6" to 5'8" with very short hair with just a touch of gray, a light goatee - and very large ears. He was wearing an over-sized, purplish L.L. Bean sweatshirt, white sneakers and a burgundy Nike baseball cap. An Orange Line train was briefly held at Back Bay for a search; he was not found on the train and service resumed. The FBI reports a hooded man walked into the Eastern Bank branch at 470 W. Broadway in South Boston last Thursday with robbery on his mind. But then the teller asked him to take his hood down. And he did. And then he ran out, the FBI says. Still, that's good enough for an attempted-robbery charge if found, so the FBI's Bank Robbery Task Force is now looking for him. If you see him, Special Agent Darwin Suelen would love to hear from you, at 617-223-6166. Photo from Bank Robbery Task Force. The Eastern Bank branch, 470 W. Broadway in South Boston, was held up around 9:30 a.m. by a white male in his late 30s, 6' with a stubbly face and wearing a navy-blue hoodie. He showed a note, ran out with cash. Boston-based Wainwright Bank, which bills itself as "the country's leading socially progressive bank", is selling itself to much larger Eastern Bank, also based in Boston. They expect to close the transaction this fall, after which time the Wainwright name will eventually disappear.